Diogo Jota to join Spurs? Tottenham manager Mauricio Pochettino wants to move for Wolves star Diogo Jota in the summer - but only if he has to offload one of his attacking midfielders. It is understood that Christian Eriksen, a long term target for Real Madrid and Barcelona, is expected to leave White Hart Lane this summer. 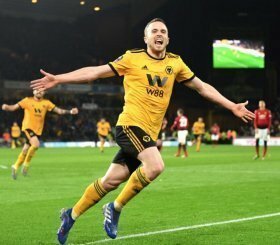 As a like for like replacement, Pochettino wants to sign Wolves' impressive attacking midfielder Diogo Jota. Jota arrived at Molineux during last summer's transfer window for a fee of around £20 million and his value has since soared after an impressive first Premier League season at the club. Jota had spent the season prior on loan from Atletico Madrid at Wolves, with the club then opting to take their first option on a permanent move for the player. The 22-year-old has so far this season bagged 6 goals in 25 games, helping to propel Wolverhampton Wanderers to the top half of the league table and confidently chasing an FA Cup, where they have secured a semi-final spot. Tottenham are ready to spend up to £50 million to sign Jota. Tottenham Hotspur in compulsion to sell Christian Eriksen?